Guest access is a feature of Linksys Routers and gateways that creates a separate wireless network from your local network. Your guests will not be able to access your network or personal data. To learn more about the Guest network, click here. Follow the steps below to disable the Guest access account of your Linksys Wi-Fi Router and gateway using the Linksys Connect. QUICK TIP: For instructions on disabling the Guest network through the web-based setup page, click here. If you have a Linksys Smart Wi-Fi router, click here. NOTE: To launch Linksys Connect on a Windows® computer, go to Start > All Programs > Linksys Connect. To launch Linksys Connect on a Mac®, navigate to the Applications folder in Go, and then start Linksys Connect. If you need more help, click here. 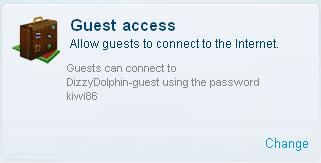 Click on Guest access in the Linksys Connect window. 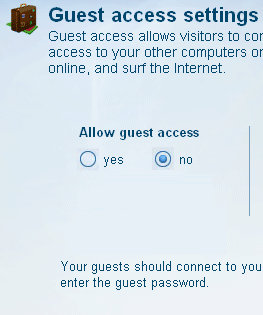 In the Allow guest access section, select no to disable the Guest network. Your Guest access network should now be disabled.